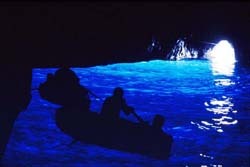 The greatest tourist attraction on the Isle of Capri is the Blue Grotto. Conditions permitting, it is an attraction that you shouldn't miss. 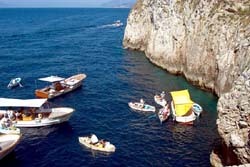 Known locally as "La Grotta Azzurra" the Blue Grotto is located along the shores of Anacapri. The Grotto is a 180-foot-long by 75-foot-long cave accessible only by boat. It was once called Gradola by the locals after the nearby landing place of Gradola. It was usually avoided because it was said to be inhabited by witches and monsters. The cave was well known by the Romans, as proved by antique statues found in the Grotto. Tours of the cave are always possible, but under optimum conditions such as clear water, a clear sky and a diffused sunlight you get a particularly intense blue. In order to fit through the narrow opening of the Grotto you are required to lie down on the bottom of the gondola. The ceiling is hardly high enough to allow the low boats to enter. The swell of the sea make this a little tricky. The gondolier has to wait for the lowest water between two waves to enter the cave. Then he hurries to drag the boat into the cave on a rope along the wall. This situation restricts the access to the cave. Boat tours are only possible with a calm sea. Even with good weather conditions high seas make a visit to the Grotto impossible. Cloudy weather is also a drawback. No sunlight on the water means only a dark cave. So unless the seas are calm and the sunlight plentiful the gondolas and the gondoliers are won't make the trip. Plan accordingly. If you are lucky enough to have melodious gondolier you will be surprised at the marvelous acoustics in the Grotto.